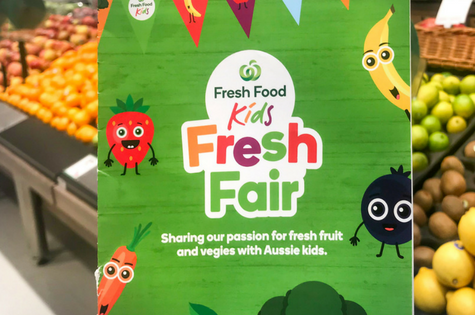 Woolworths have announced its ambition to have up to half a million Aussie kids partake in free ‘Fresh Food Kids Discovery Tours’ within their stores in the next 12 months, in an initiative aimed at inspiring the next generation to love their fruit and veg. With almost 95% of Australian children struggling to meet their recommended intake of fruit and vegetables1, Woolworths is committed to making it easier for kids to get acquainted with their greens, and find fruit and vegetables they enjoy. A successful pilot of the program has run in a select number of Woolworths supermarkets over the past few months, with the ‘Fresh Food Kids Discovery Tours’ bringing Australian students in-store to learn all about fruit and vegetables in a fun and interactive way. On the tours, students have the opportunity to discover and try new fruit and vegetables, learn how and where they grow , understand the benefits of eating a good variety of fresh fruit and vegetables and play veg-inspired games through a full sensory experience. Fresh Food Kids Discovery Tours have also been designed with the school curriculum in mind, catering to kids from Early Learning Centres all the way up to year 6. Woolworths Supermarkets Managing Director, Claire Peters said; “We know that getting children to eat fruit and vegetables every day can be tricky and parents can find it challenging to get their kids to eat their required daily intake. “The Fresh Food Kids Discovery Tours are designed to inspire our next generation of Aussie kids make smart and fresh food choices in an environment that they will be familiar with.